Can Long Run get the job done today? OH, THE BEST laid plans. They can easily be scuppered and nowhere more easily than in horse racing. Trainers sit down at the beginning of the season and plan a campaign for their horses with the view to arriving at their main target in the peak of condition. The deluge currently hitting the British Isles has thrown a lot of those plans in doubt. The question on trainers’ minds right now is do they want to give their horse a really hard race on soft or heavy ground and risk jeopardising the rest of the season. This afternoon’s Grade 1 Betfair Chase at Haydock (3.05pm), where the going is soft, soft to heavy in places at present, is a case in point. Long Run probably has two main targets this season: to regain the King George at Kempton this Christmas and then to regain the Gold Cup at Cheltenham. Having won both in the 2010-2011 season, there were many who thought he was a disappointment last year. Trainer Nicky Henderson believes he didn’t show the form he had shown the previous year; however he believes he has come back to his best judging by his appearance and work at home. His form last year may not have been as bad as some suggested. He reappeared in the Betfair where he was beaten eight lengths by a rejuvenated Kauto Star before going down by less than two lengths to the same horse in the King George. He then went to Newbury where he broke the course record when he defeated Burton Port. In the Gold Cup at Cheltenham, it was his jumping which let him down when it came to the crunch and he finished third, three lengths behind the winner Synchronised. That race once again exposed his Achilles’ heel; his jumping has let him down on numerous occasions despite the best efforts of the team at Seven Barrows. With the ground turning soft, soft to heavy in places at the moment, will he be ready for what could potentially be a hard race? He is the highest rated horse in the race but there could be a new kid on the block. Silviniaco Conti has continued to impress a lot of people following an eye-catching end-of-season run at Aintree last April. Paul Nicholls gives the impression that this has been his target for a while, and he will skip the King George before going for the Gold Cup. He hasn’t raced too often on this ground but Nicholls believes that the son of Dom Alco, whose progeny seem to handle the ground, is ready for a big run. Donald McCain’s Weird Al runs best when fresh, but he appears to have developed a problem with burst blood vessels. Having been withdrawn from the Charlie Hall at Wetherby, which he won last year, it’s likely that he could be primed for this. The ground shouldn’t be a major problem and if he was at his best, he could be involved in the finish. However, he could be found out. The Giant Bolster has a bit of a cult following. His jumping has improved since his novice days and his second in last season’s Gold Cup was a career best. If he runs up to his best, he could be involved. Cannington Brook won’t be inconvenienced by the ground but would have to show huge improvement or have something dramatic happen to win, while Wayward Prince was probably flattered by his 11-length second to Silviniaco Conti at Wetherby. While SILVINIACO CONTI beat a few horses who were on the way down at Wetherby, it was the manner of his victory there and at Aintree that impressed. As he should also have a fitness advantage to go with his trainer’s bullishness, make him a tentative selection. Down at Ascot the going is currently described as soft, but with light rain forecast, there may be some change. If it does rain, that should ensure that the ground stays loose and doesn’t become tacky. The Grade 2 Amlin Chase is due off at 2.10pm with five runners declared. For Non Stop romped away with the Old Roan Chase at Aintree at the end of October. The strong pace they went that day obviously played into his hands but it’s unlikely he’ll have the same pace this afternoon. Ghizao from the Paul Nicholls yard had a bloodless victory on his seasonal debut at Kempton when Kumbeshwar fell. He won’t be inconvenienced by the ground, but will have to find a bit of improvement if he is to win. Captain Chris has disappointed somewhat since his novice days. 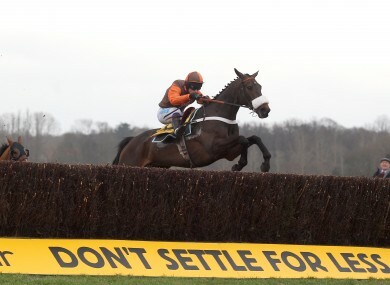 Displaying an alarming tendency to jump way out right, he should be helped by Ascot’s right-handed track. He arguably ran his best race of last season when fourth in the Ryanair Chase, beaten six lengths by Riverside Theatre. He has the ability but whether he can jump well enough first time back remains to be seen. Quincy de Pictons looks outclassed and the one to beat is FINIAN’S RAINBOW, the current two-mile champion. Ten wins from 13 races speaks for itself. He got a great ride from Barry Geraghty to beat Sizing Europe at Cheltenham and followed up with an equally impressive victory over 2m4f in the Melling Chase at Aintree. He has won on soft ground and also first time out, and he should be good enough to win what has been his early-season target. Only four runners have been declared for the Grade 2 Coral Hurdle (Ascot Hurdle) but what an intriguing contest it is. Having won five in a row at the start of his career, Get Me Out Of Here then had a frustrating streak before finally getting his head in front at Fairyhouse last Easter where he beat the useful Tofino Bay. He reappeared at Kempton in October where his slicker jumping enabled him to beat another of today’s opponents, Brampour, by just over a length. The latter is more favoured by the conditions of the race here and if his jumping improves he might reverse the placings. While Brampour improved dramatically last year and ran up to his rating in the Champion Hurdle, he will need more improvement if he’s to win here. Alan King’s Raya Star has improved with every run. However this is his first run out of handicap company and while some of his form reads quite well, he has it all to do. OSCAR WHISKY is the one they have to beat. Winner on 11 of his 15 races, we can ignore his defeat to Big Buck’s last season as he patently didn’t stay. He has a good turn of foot and will have too much in the locker for his opponents here. Email “Mark your Card: your best bet for today’s Grade racing”. Feedback on “Mark your Card: your best bet for today’s Grade racing”.